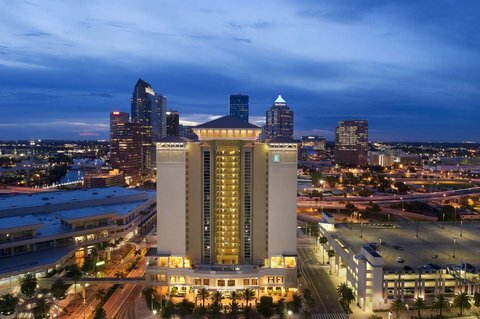 The Embassy Suites Hotel Tampa Downtown offers great views and great service at a reasonable price. The location is close to Tampa Convention Center (across the street), Tampa Bay History Center, and Port of Tampa. Additional points of interest within a mile include Florida Aquarium and Tampa Theater. I have had hotels that had a better drive up entrance but once I found it the landscaping was outstanding (it’s the feature picture of Hotel-Opinion.com). When I pulled in and the valet was there, smiling and in uniform. The exterior was immaculate, beautiful, colorful and the team took great pride in it. The lobby looked like an Embassy without many surprises, except for the Starbucks in it. I love Starbucks!